We are receiving barcodes (EAN-13) from a serial port. We have some barcode scanners connected, each one send data, when read. The data contains: its identification number (the first character) and barcode information (thirteen digits). When the Advanced Serial Data Logger receives the information from the serial port, he adds a date and time stamp. In a log file this information is registered correctly, but we should create other ASCII file with different structure in the CSV format. The figure above shows that the data flow is very simple. Each record has a fixed size and a fixed position of each item. We need to recognize ending characters of an each data record. Please, enable display output for non-printable characters with a character code below than 0x20h. Please, set the following options. Then click the "OK" button and try to receive data from a port. You should receive the data like on the figure below. Fig.3. Barcode scanner data logger. Data received. This is another view of the received data. All non-printable characters were replaced with their code like #0D. 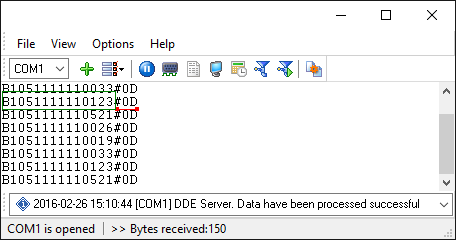 Now, it is clear, that a data packet (in a green rectangle) ends with #0D (underlined by red). Now, we are ready for configuring modules. First, please, select the "ASCII data parser and query" plug-in (fig.4a, pos.1) from a drop-down list. 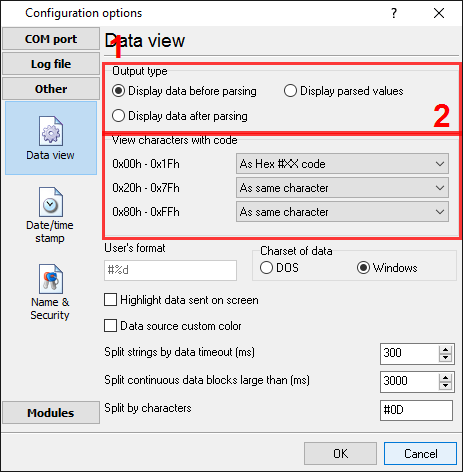 Then, enable a parsing option for data received (fig. 4a, pos. 2) and select necessary data export plug-ins. 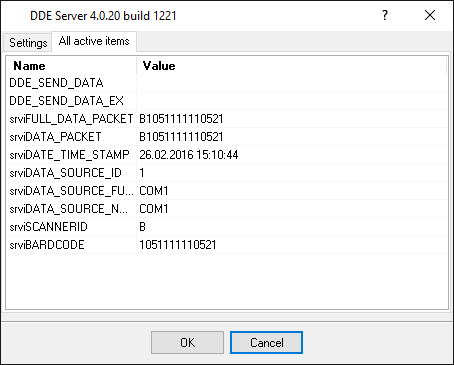 The DDE server (fig.4b, pos.3) will help us to check that the data packet is parsed and exported. The "Local database" plug-in will write data to an ASCII file with the CSV format. Pic.4a. Barcode scanner data logger. 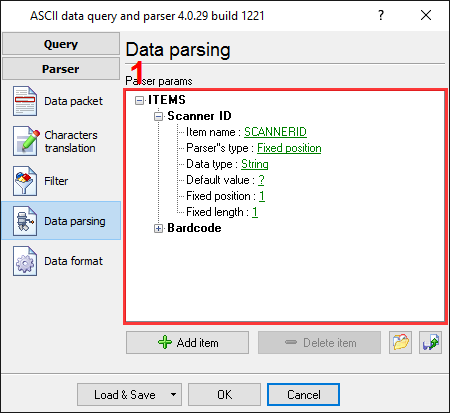 The data parser plug-in. Pic.4b. Barcode scanner data logger. Data export plug-ins. 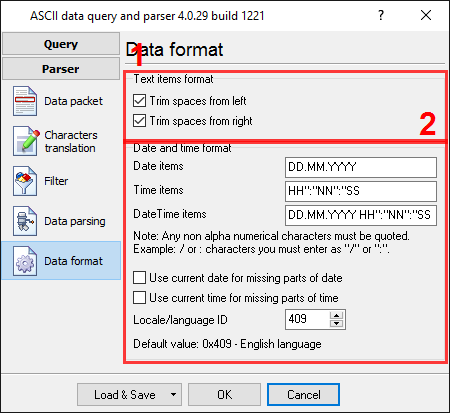 Now, please, open a configuration window of the ASCII parser and query plug-in (click the "Setup" button near a drop-down box fig.4a, pos.1). The dialog window will appear on the desktop (fig.5). Fig.5. Barcode scanner data logger. The configuration window of the parser. The configuration process will very simple if you've examined your data flow in the data logger window (fig.3). You should type in the same as in the data logger window in fields 1 and 2. Field #1 marks the beginning of the data block and the field #2 marks the end. In the example, our data block does not contain a start marker. You should type a value from the fig.3, which is underlined by red. The field #3 is empty, because our data packet doesn't contain characters, which should be ignored. Ok. We are going to the next page. This is a very important part of the parser configuration. 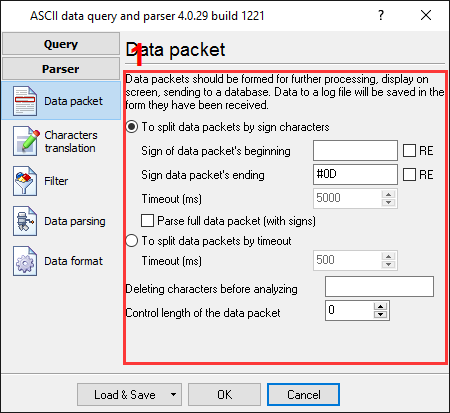 The parser uses this information to extract parser items (variables) from a data packet. Our data packet contains 2 data items, which should be placed to different variables. Later, these variables will be used in the data export and data filter plug-ins. In our case values from these variables will be placed to different columns of a target CSV file. Fig.6. Barcode scanner data logger. Parser items. On the next page (fig.7) you can specify basic format options. Because we've specified the "String" data type for both parser variables, then first two options allow removing blank spaces from a value. Other options are not applicable in our case. Fig.7. Barcode scanner data logger. Format options. Please, click the "OK" button and close the configuration window and then click the "OK" button again in the options window. Now, our parser is ready and we can test it. Connect your device and/or power it on and try to receive a data packet from a port. If the parser is configured properly, then the DDE server window will display our variables name and value (fig.8). Fig.8. Barcode scanner data logger. The DDE server window. How to write data to a log file with the necessary format is described in the second part.